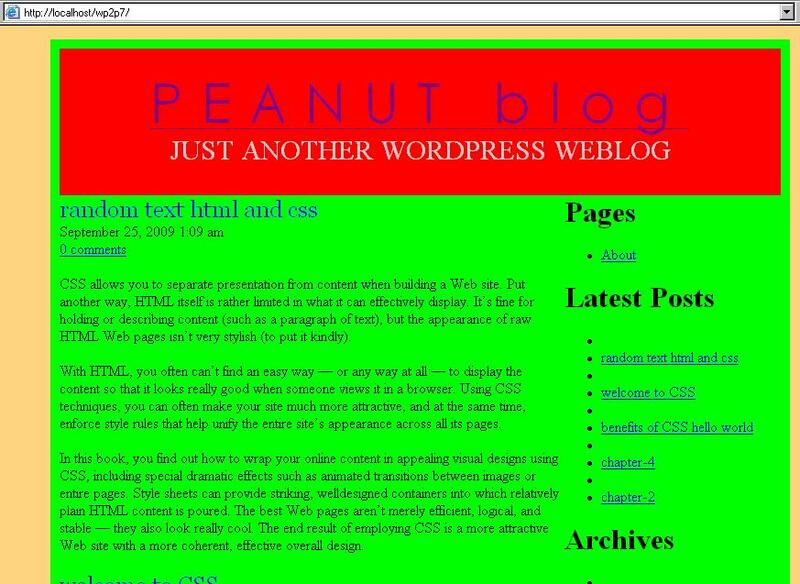 Peanut Blog and my first WordPress Theme. This morning, I’m happy to inform the ‘world’, hehehe, that I’ve made my first significant (as far as I’m concerned) step in the how-to of WordPress themes. Check this out: I finally got my self made theme working yesterday night after about 1-hr. I had been reading tutorials here and there since my last post. The screen-cap is below – I admit, estremely immature, but hey, at least its working, and I did it. Please forgive the rainbow colors(background, header, main area, etc), but I had to use them to be able to distinguish the container from the header, etc, in my code. I’m still cranking my head over some PhP codes. I’m a serious newbie, but I got this one working though. Where there is a will, there is a way. I have an installation of Apachefriends XAMPP 1.54a on a Windows XP desktop. Thanks to Iconico.com’s color picker, which I used to put things together.